When Jordan Catalano Is Around My Whole Body Feels It. If you are like me you grew up believing that the better part of your high school career would be spent skipping class to smoke in the bathroom and making out with delicious guys in the boiler room. If you are like me this probably didn’t actually happen. And if you are like me you got all of these ideas from ABC’s early ‘90s drama My So Called Life. In case you don’t remember, My So-Called Life (MSCL) began in 1994 and was about Angela Chase, a social outcast played by Claire Danes, and her dismal view on the high school experience. Although the show only lasted 19 episodes its pre-grunge style, unique storytelling techniques, and groundbreaking characters (most notably Rickie Vasquez the first gay teen on primetime T.V.) have made it one of the most memorable shows in ABC history. 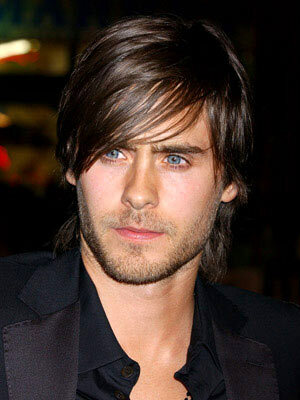 However for me the best part of the series was the moody and uneducated Jordan Catalano, played by Jared “ice eyes” Leto. Every week Jordan had me hanging on his every word. And Jordan looked so good in a blue plaid shirt that I didn’t care he could only read at a third grade level. After the show ended on a relationship cliffhanger I was devastated. But luckily Jared Leto’s career did not die with the series. I could see a trace of Catalano in every character he played. After MSCL Leto was in a zillion fantastic movies including American Psycho (2000 ), Requiem for a Dream (2000 ), Girl Interrupted (1999), Fight Club (1999) , and most recently as John Lennon’s overweight slayer in Chapter 27 (2007 ). Currently Leto spends most of his time writing songs and using his drop dead gorgeous looks to play bass for his band 30 Seconds to Mars. Although the band is decent it is nowhere near as rad as the Frozen Embryos. Jordan, I miss your inability to decipher the days o f the week, the way your words slur together when you try to read, and your ever seductive locker lean.